Have you ever smelled gas in your neighborhood? If so, you probably called the gas company to alert them. That is what we’re supposed to do, right? Then they’re supposed to send someone out to check the pipelines and make sure the area is safe. We have procedures in place to prevent a catastrophic disaster, right? Turns out the procedure and safety measures we’ve been taught don’t really ensure our safety. 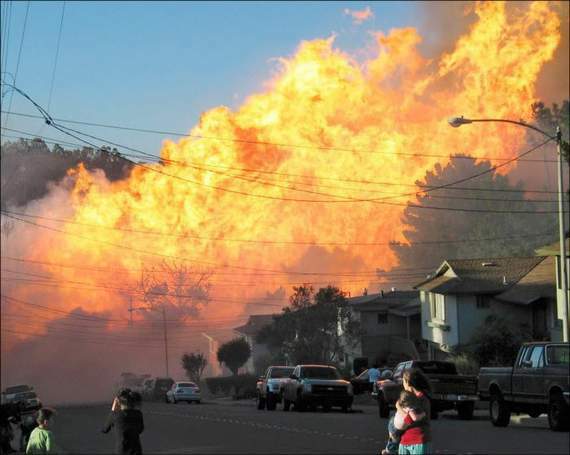 Prior to the San Bruno Explosion in Northern California on September 9, 2010, residents had been calling PG&E, the gas utility, for weeks to complain of potentially dangerous gas odors in the community. And the residents were right. It turns out this deadly explosion was caused by a ruptured natural gas pipeline that was 40-50 years old. And the problem is not limited to natural gas pipelines. We are also suffering from spills carrying crude oil. Obviously we can’t leave it up to the big oil companies to regulate themselves. We should have learned that from the oil spill in July. Nope, not the one in the Gulf, but the one that dumped 800,000 gallons of heavy crude into the Kalamazoo River in Marshall, MI. The destruction of wildlife is obvious. Waterways and natural habitat destroyed. But Marshall, MI isn’t exactly a remote area. This oil spill posed serious health risks to the community. Residents’ air and water were poisoned! How can we prevent accidents like this in the future? Should stricter regulations be placed on gas utilities? Or should the regulators be stricter on enforcing such regulations? This ruptured pipeline hit close to home for the residents in Detroit. The 48217 zip code of Southwest Detroit is just about an hour and a half away from Marshall. Marathon, the oil tycoon in Southwest Detroit, has begun construction to allow for refining of heavy crude, Canada’s tar sands. Part of this upgrade, of course, includes a pipeline which runs dangerously close to schools, homes, even a VFW Hall. The safety of the 48217 community is very seriously being compromised. We’ve seen time and again the accidents that can happen from unmonitored pipelines and we’re supposed to continue trusting the oil company to monitor them? That’s a perfect example of letting the fox guard the chicken coop! These pipelines pose excessive risks to public health & safety. What we need to focus on is determining how close is too close. Obviously the pipelines were too close in San Bruno, CA and Marshall, MI. The real lesson to be learned here is the need for buffer zones between pipelines and neighborhoods. Could San Bruno Happen In San Antonio? The conditions that led to the natural gas pipeline explosion in San Bruno, California, in early September could exist in San Antonio or in any metropolitan area where large, high pressure gas pipelines cross old municipal water pipelines. Based on eye witness statements and published accounts of the disaster, this corrosion engineer has a theory on what could have happened. The 30 inch pipeline was installed in 1948 when pipelines were installed without coatings or were often coated by hand over the ditch. Based on the pipeline’s age, it is likely that it was protected against corrosion with an impressed current cathodic protection system. Firefighters on the scene stated that there was no water in the fire hydrants with which to fight the fire. This leads one to speculate that the water main was severed in the explosion. Pictures of the crater showed it to be full of water. Old water mains are often made of cast iron or ductile iron. Newer water pipelines are made of welded steel or non-metallic PVC pipe. If the water pipeline was poorly coated steel, cast iron or ductile iron with its joints bonded across each other, this engineer has an explanation of what could have happened. Electric current from Impressed current corrosion protection systems on gas pipelines can collect on buried water pipelines. Because electricity follows the path of least resistance, it would typically discharge off the water pipeline and back onto the gas pipeline at the closest point between the two pipelines which would be where they cross each other. When electric current flows off a pipe and into the soil, a corrosion pit is created. Over time the pit can become a hole. Water mains are usually buried very deep to prevent the water in them from freezing during the winter. The gas pipeline was said to be buried about 3 ft. deep. Assuming that the above conditions existed, a hole in the top of a high pressure water main would have scoured out a larger hole in the pipe from the pressure of the water. This would have had enough force to create a high pressure water jet into the overlying gas pipeline. The force of the water jet could have caused the 62 year old gas pipeline to rupture causing the subsequent explosion. The answers to the above assumptions will come from maintenance records by the gas company and the water utility. If this theory is found to be correct, there are preventive measures that can be taken to prevent corrosion of water mains by gas pipeline or gas well casing rectifier systems. Magnesium anodes are often used instead of rectifiers to protect newly installed pipelines with fusion bonded epoxy (FBE) coatings. Magnesium anodes on gas pipelines can not cause corrosion to water mains. One solution in metropolitan areas to protect water mains from gas well or gas pipeline rectifier systems is to use magnesium anodes instead of rectifiers. Another way to prevent damage to water mains is to connect the pipelines together with wires at crossings. These are called bonds. Corrosion engineers are trained in this field of science and are the best source of information on preventing corrosion and fixing problems that could have led to the San Bruno explosion. or figuring out more. Thank you for great info I used to be on the lookout for this info for my mission. « We know what’s in the air, but what’s in our bodies?